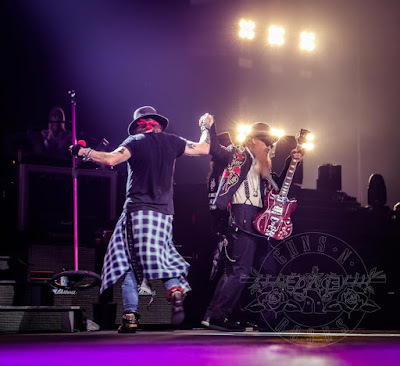 Guns N’ Roses were joined by ZZ Top guitarist Billy Gibbons for a performance of their 1989 hit, “Patience”, at the Toyota Center in Houston, TX on November 10, and the band are sharing video from the concert. “Great night with Billy Gibbons in Houston tonight!,” posted the group on Twitter after the show. ZZ Top opened for GNR during a pair of Texas dates this fall before they were forced to shut down their 2017 Tonnage Tour when bassist Dusty Hill came down with an undisclosed stomach ailment. Last month, Guns N’ Roses were joined by pop singer Pink for a performance of “Patience” at Madison Square Garden in New York as the group plays shows on a fall North American leg of the Not In This Lifetime Tour that will wrap up at The Forum in Los Angeles, CA on November 29. Guns N’ Roses have extended the reunion tour into a third year with the addition of summer 2018 concert dates across Europe. Set to begin in Berlin, Germany on June 3, the 7-week run includes a mix of stadium shows and festivals, including appearances at Italy’s Firenze Rocks, Belgium’s Graspop Metal Meeting, and Download in the UK, Paris and Madrid.